Healthcare Costs Us AllEliminate The Muda! Healthcare costs are rising at a rate greater than wages or inflation. 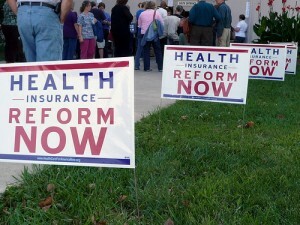 Too many people are uninsured or underinsured. Catastrophic healthcare costs are forcing millions of Americans into bankruptcy even when they are insured. Lack of insurance portability limits people from taking new jobs. To be fair, whether you agree with President Obama’s healthcare strategy or not it is difficult to not give him credit for trying to take on such a big issue. Again, regardless of political affiliation it is also difficult to see how the Government’s plan can work. In Obama’s speech last week he shared 4 ideas in particular that most anyone would want to see come true. It will be illegal for your insurance company to drop you for a pre-existing condition. Insurance companies will no longer be able to place a cap on the amount of coverage you will be able to receive in a year or lifetime. There will be a limit on how much you can be charged for out-of-pocket expenses. All four ideas will obviously increase the costs of healthcare and insurance but Obama still stands behind the idea that while increasing costs his plan will be able to provide the opportunity for anyone to find health insurance at an affordable rate. Obama believes that the Government can give more for less. This sounds nice, but what is the Governments track record? According to the Office of Actuary Centers for Medicare and Medicaid Services, the U.S., both public and private, spent $2.12 trillion in 2006 on healthcare. Per the World Health Organization this is more than any other country in the world both in terms of total dollars and in terms of dollars per person. The Organization for Economic Cooperation and Development shared in 2006 that the U.S. spent $6,933 per capita on health care. Furthermore their research reflected that of all health care expenditures, the U.S. Government was directly responsible for 45.2% of this total. As taxpayers we coughed up $958.2 billion on health care. Referring to the statistics provided by the U.S. Census Bureau we learn that 201.6 million people were covered by private health insurance in 2006 while 80.3 million were covered by Government healthcare. Based on this data we see a large disparity in the costs of running Government healthcare vs. private insurance. Per capita, private insurance costs $5,762 while the Government was spending $11,933. While it is plain to see that our current health care system is buried in inefficiency based on the numbers available, how can anyone believe that a Government run healthcare plan could be more efficient or effective than the current private system? What is the solution to our challenges? Based on my own experience, I have come to believe we too need something radically different but a Government plan is not it. Not long ago I was sick. While the doctor was confident I some type of virus he simply didn’t know what it was. My doctor had run several tests to determine the cause without success. There was one more test he considered, but it would not be covered based on the information from my insurance. The doctor admitted it was a shot in the dark but he gave me the option. My question to him was “how much does it cost?” This, I realized at that moment, was the first time I had ever asked a doctor this question. The doctor simply didn’t know. He asked a few co-workers but no one knew the answer. Had it be $50, by all means do the test; $300 and we would have to discuss in detail the pros and cons. In the end, I walked out of the office with an unknown ailment left untreated. Luckily I eventually beat whatever it was but the lesson I learned completely changed my perspective on this heated debate. In virtually every other business transaction there is a clear understanding between a customer and the provider regarding the costs of products or services and the value that one would derive from them. The customer is virtually always aware of the actual and total charges that will be applied. When faced with full disclosure and clarity the customer will make the best choice for their financial situation. In many cases of using other insurances, like for a car accident or home damage, the consumer is directly involved with choosing the vendor that provides the repair or service. The consumer is informed of the options, choices and costs. The insurance company may only cover a portion or certain aspects of the repair but the customer often has the ability to override or amend these options, although it may be at their cost. Additionally, it is the consumer that chooses the insurance company and level of coverage in the first place. We shop around to determine where we can get the most coverage for the least cost and we have dozens of companies to choose from. The competition drives insurance companies to be more efficient. We can carry this coverage from job to job and in many cases from state to state. None of this is true with health insurance. Why not? Why do some states only have 2 or 3 providers to choose from. Why can’t I take my health insurance with me? And why can’t I be in control of what tests my doctor runs and which ones he doesn’t? I believe we need major deregulation of the health insurance business. We don’t need fewer options we need more. We don’t need the Government making decisions, we need to make them. If we feel the direct impact of the costs of healthcare I believe our population will do what it does better than the Government, limit spending. Part of managing your personal finances is managing your tax liability. Ensuring that your taxes are properly calculated, maximizing deduction you might be eligible for and taking advantage of any tax deferred methods of investment are all part of the any good financial plan. Beyond individual effort to limit your tax liability, as a U.S. citizen you also have the right, some would say the obligation to take an active role in helping guide how our Government manages the tax dollars they collect. You may agree with Obama, you may agree with me or you may have a completely different opinion. Please take a moment to comment below to share your point of view. But if you won’t share your point of view here, please share it with your Congressman and Senator!